The number of Americans without health insurance coverage rose from 45.7 million in 2007 to 46.3 million in 2008, according to a report released today by the U.S. Census Bureau. The share of Americans with employment-based coverage continued to erode for the eighth year in a row from 59.3% of Americans covered in 2007 to 58.5% in 2008. These modest increases in the uninsured are only the tip of the iceberg. The recession that began in December 2007 and took hold in 2008 worsened in 2009. Given that the economy has deteriorated significantly since 2008, the current state of health insurance is worse than today’s report shows. • In 2008, 46.3 million people were uninsured, up 683,000 since 2007. The number of uninsured Americans is nearly 8 million higher than is was in 2000. • The share of Americans with employer-sponsored health insurance declined for the eighth year in a row, down from 59.3% in 2008 to 58.5% in 2007, a total decline of 5.7 percentage points since 2000. • The only reason why the drop in employer-sponsored insurance (ESI) did not translate into an increase in the share uninsured is because 3 million more people were covered by Medicaid/SCHIP in 2008. • The decline in ESI coverage through the 2000s was felt across the country, with a statistically significant decline in 42 states. No state had a statistically significant increase in coverage over this period. • Unfortunately, the number without ESI and thus without any insurance is likely to swell in 2009 as the unemployment rate jumped between 2008 and 2009. • The growing lack of health security further reinforces the need for immediate and large-scale reform of the U.S. health care system. 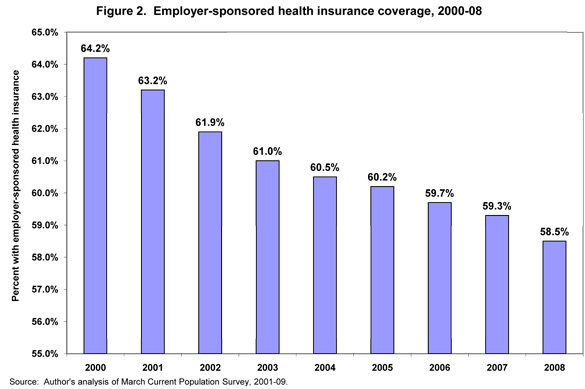 Employer-sponsored health insurance remains the predominant form of coverage in 2008, however, the rate of coverage fell over the year (as shown in Figure 1). 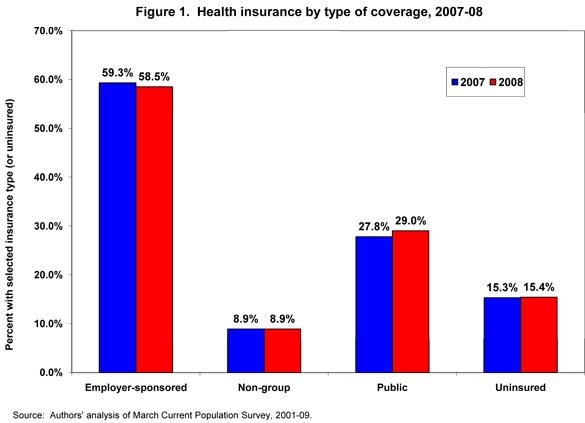 Non-group coverage remained flat over the period while public coverage rose significantly from 27.8% in 2007 to 29.0% in 2008. It is this increase in the percent of Americans covered by public insurance that has kept the share of Americans without insurance from rising in 2008 as ESI fell. The Census report suggests evidence of further unraveling of the employer-based system as the share of persons covered through work (either their own or a family member’s employer) declined for the eighth year in a row. As shown in Figure 2, employer-sponsored health insurance was 58.5% in 2008, down from 59.3% in 2007, and a total decline of 5.7 percentage points since 2000. ESI coverage for children continued its unabated decline, falling again between 2007 and 2008, from 59.5% to 58.9%. Children coverage through the employment-based system has fallen 7 percentage points since 2000. Children’s uninsured rate did not decline over the last year, however, as their Medcaid/SCHIP rates continued to rise, jumping from 28.1% in 2007 to 30.3% in 2008. While children have been shielded from the declines in ESI through public insurance increases, non-elderly adults have not been so fortunate. The 18-64-year-old population experienced a statistically significant increase in the share uninsured from 19.6% to 20.3%, an increase of 1.5 million uninsured adults. Workers experienced significant decline in coverage as well, an increase of nearly 1 million more uninsured workers. The non-elderly population across the country relies on ESI as their primary form of coverage, however, the incidence of coverage varies widely from state to state. 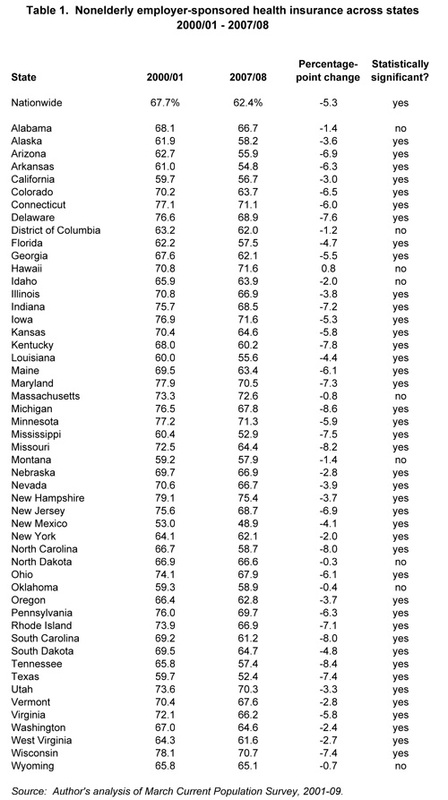 Table 1 compares ESI coverage rates for the under-65 population across states between 2000-01 and 2007-08. New Hampshire has the highest rate of ESI coverage for their under-65 population at 75.4% in 2007/08. This rate is followed closely by Massachusetts, Iowa, and Hawaii. It is not surprising that Hawaii and Massachusetts are among the highest coverage rates as each state has an employer mandate. Less than half of New Mexico’s non-elderly population has ESI at 48.9%. Mississippi and Texas also have relatively low rates of coverage. Since 2000-01, 42 states have experienced statistically significant losses in ESI coverage. Five states—Michigan, Tennessee, Missouri, South Carolina, and North Carolina— experienced losses of at least 8 percentage points over the 2000s. Unfortunately, these losses are only the beginning of what we expect to be even larger losses this year. One of the clearest indicators of the deepening recession is the unemployment rate. In 2007, the most recent peak year, the unemployment rate was 4.6%. 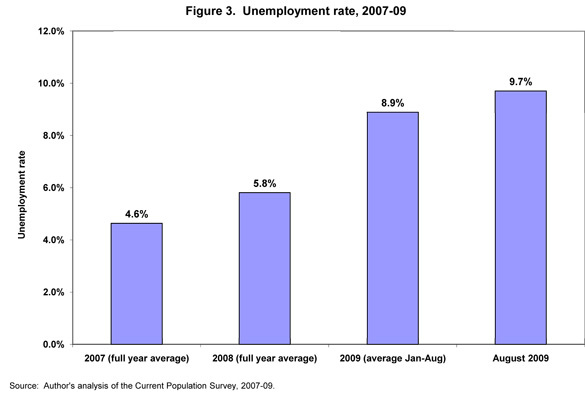 As shown in Figure 3, average unemployment rose modestly to 5.8% in 2008. The unemployment rate this year so far has averaged 8.9% and unemployment hit a high in the most recent report for August 2009 at 9.7%. This dramatic increase in unemployment over this recession is one of the worst on record (Shierholz 2009). While employer-sponsored health insurance remains the predominant form of health coverage for the under-65 population, it is often the case that when people lose their jobs, they lose access to their health insurance. Therefore, the modest declines in ESI from 2007 to 2008 are likely to be exacerbated in the future by the sharp rise in unemployment from 2008 to 2009. Research has shown that a 1 percentage point increase in the unemployment rate is associated with a 0.9 to 1.0 decline in the share of the under-65 population with ESI (Holahan and Garrett 2009; Cawley and Simon 2003). The under-65 rate of employment-based coverage was 61.9% in 2008, down 1.0 percentage points from 2007. It can be expected that the ESI coverage will drop another 2.9 percentage points to about 59% in 2009. While not one-for-one, a drop in ESI coverage is strongly associated with a rise in the number of uninsured Americans, only lessened by increases in public coverage (particularly among children). Using an association found between unemployment and the uninsured detailed in Gruber and Levitt (2002), it is likely that the current number of nonelderly uninsured is around 50 million. ity people experience as they lose their job, their financial security, and their access to health insurance. As President Obama reiterated in his speech before a joint session of Congress on Wednesday night, this country needs bold, comprehensive national reform. As employer-sponsored insurance has failed many Americans throughout the 2000s, even during an economic expansion, it is important to ask whether we should rely on this system as the primary and back-up source of coverage for our under-65 population. A safety net in the form of a national exchange with a public insurance option is vital to make sure those that lose their jobs do not also lose their access to coverage. The data released September 10, 2009 by the U.S. Census Bureau highlight the fact that the current system does not provide stable and secure coverage for many Americans. The share of Americans with employment-based health coverage fell for the eighth year in a row from 59.3% in 2007 to 58.5% in 2008 while the number of uninsured Americans rose from 45.7 million in 2007 to 46.3 million in 2008. The continued drop in the share of Americans with employer-sponsored health insurance and the associated rise in the uninsured over the 2000s is only expected to worsen in 2009 from the deepened recession. Americans need affordable, secure alternatives to a system wherein you lose your coverage when you lose your job. The status quo is simply not a viable solution. Cawley, John, and Kosali I. Simon. 2005. Health insurance coverage and the macroeconomy. Journal of Health Economics, Vol. 24 (2), pp. 299-315. Gruber, Jonathan and Larry Levitt. 2002. Rising Unemployment and the Uninsured. Washington, D.C.: Kaiser Family Foundation. Holahan, John, and A. Bowen Garrett. 2009. Rising Unemployment, Medicaid and the Uninsured. Washington, D.C.: Kaiser Family Foundation.